Fill a large saucepan with cool water, add eggs, and bring to a low simmer over medium heat. Cook for approximately 10 minutes, drain water, and fill pan with cool water. When eggs are cooled, peel them and slice in half lengthwise. Remove the yolks and place in a small bowl. Add mayo, mustard and Worchestershire sauce, mash and stir until smooth and creamy. Fill egg whites with the yolk mixture. Pipe ketchup in a spiderweb-like pattern across the top of each egg. Garnish each with half an olive. 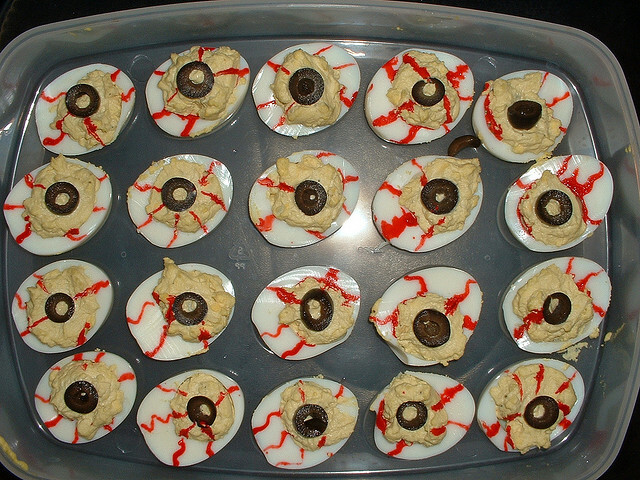 These deviled eggs are easily made into ghoulish bloodshot eyeballs with ketchup and black olives. Perfect for Halloween!